Yeah, sure, you probably know a lot. But there's always that movie or star constellation or post-graduate vocabulary word or Wikipedia fact that you can dig into. Here are the six best apps that'll satisfy your insatiable thirst for knowledge. This is an app that transformed itself from joke to recommended download in record time. 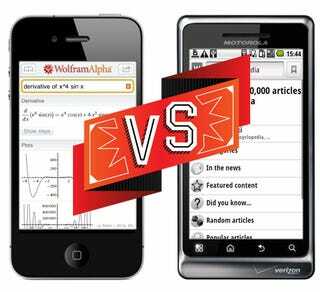 All it took, in the end, was a price change: Wolfram Alpha's app, now that it costs $2 instead of $50, is a steal. For those of you who aren't familiar with the Wolfram Alpha website, it's what its creators call a "computational knowledge engine." It's part graphing calculator, part trivia repository, and part search engine—albeit for a select set of databases, most of which are academically oriented. Ask it who Justin Bieber is, and it won't know. Ask it to divide the population of Waco, Texas by the number of stars in the observable universe, and it'll give you this admittedly meaningless number in seconds. 2$, iPhone. Wikipedia's creators insist that their project is one with lofty intentions; first and foremost, though, it's a site that lets any jerk become an instant expert on anything. Wikipanion makes the process of Knowing It All a good deal faster than it would otherwise be, with a predictive search interface, in-page searching, bookmarking and the like. Its main appeal, though, is that the time from app-tap to answer is extremely short, and its just nicer to look at than the ‘Pedia's mobile interface. Free version is fine, unless you really want to queue materials for reading offline. Free, iPhone. • CIA World Factbook: Turn any offhand comment about any country into a super-contextualized discussion about geopolitics and world health! But no seriously, this is a fascinating collection of data about the world we live in. Google Mobile: Get instant feedback from THE search engine, whether you enter your queries with text, by voice, or through photos. Animated Knots: Seven years of Boy Scouts, or an $5 app. Your call! • IMDB: Remember how fun it was to argue about objective movie trivia, before IMDB existed? Or when it was only accessible by computer? Ha, me too. This app will settle your scores about film scores in seconds. • SoundHound : What's this song called? Oh, ok then. • CovertBot: THIS many feet equals THAT many meters equals THAT many yards equals THIS many kilograms. Well, almost. For those who need to know it all, even Wikipedia isn't enough. That's why Wapedia is perfect: it gives you all of Wikipedia, in a quick and easy-to-understand format, and offers more reference options to search through like wikiquotes, wiktionary, and even more specialized wikis (Call of Duty, Mad Men, etc) for the most specific information you can glean from in an app. You can go find information by searching (which mimics Google Instant-ify auto searches) or browse what's "in the news" or flip through random and popular articles. Basically, it's the perfect search engine to find user-generated information about as many topics as possible.Free, Android. Sure, maybe your friends hate you for always correcting them, but they absolutely love you when you're on their team for trivia games. Download Trivia Burst, an Android trivia game, so you can show off your know-it-all brain in a more playful setting while still feeding your ego. There's 22,000 different questions in 22 categories, so you're bound to impress someone with that big brain of yours. Free, Android. • Factbook: Gives information about countries from the CIA World Fact Book and United Nations data and statistics. Knowing fun facts about the world is important, you know. • Wikidroid: Does Wikipedia, quick and fast. • Urban Dictionary: Stay up to date with all the slang and internet lingo people say these days.